With scripting, computer programming becomes integral to the digital design process. It provides unique opportunities for innovation, enabling the designer to customise the software around their own predilections and modes of working. It liberates the designer by automating many routine aspects and repetitive activities of the design process, freeing-up the designer to spend more time on design thinking. Software that is modified through scripting offers a range of speculations that are not possible using the software only as the manufacturers intended it to be used. There are also significant economic benefits to automating routines and coupling them with emerging digital fabrication technologies, as time is saved at the front-end and new file-to-factory protocols can be taken advantage of. Most significantly perhaps, scripting as a computing program overlay enables the tool user (designer) to become the new tool maker (software engineer). Though scripting is not new to design, it is only recently that it has started to be regarded as integral to the designer's skill set rather than a technical speciality. Many designers are now aware of its potential, but remain hesitant. 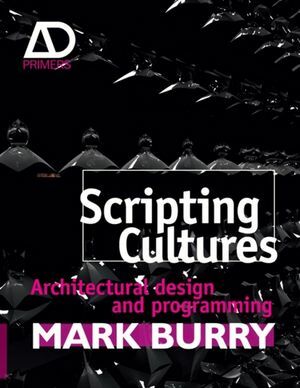 This book treats scripting not only as a technical challenge, requiring clear description, guidance and training, but also, and more crucially, answers the question as to why designers should script in the first place, and what the cultural and theoretical implications are. Investigates the application of scripting for productivity, experimentation and design speculation. Offers detailed exploration of the scripting of Gaudí's final realised design for the Sagrada Família, leading to file-to-factory digital fabrication. Features projects and commentary from over 30 contemporary scripting leaders, including Evan Douglis, Marc Fornes, Sawako Kaijima, Achim Menges, Neri Oxman, Casey Reas and Hugh Whitehead of Foster + Partners. Mark Burry is Professor of Innovation (Spatial Information Architecture) at RMIT in Melbourne, Australia, where he is also Director of the Spatial Information Architecture Laboratory and Director of the Design Research Institute. He is an Australian Research Council Federation Fellow and Member of the Advisory Board of Gehry Technologies in Los Angeles and has collaborated with leading international architectural and engineering practices. Burry is probably best known for his work on Antoni Gaudí's Sagrada Família in Barcelona, where he is Executive Architect and Researcher, and has been working for thirty years on the realisation of the completion of Gaudí's vision through computer-aided techniques.